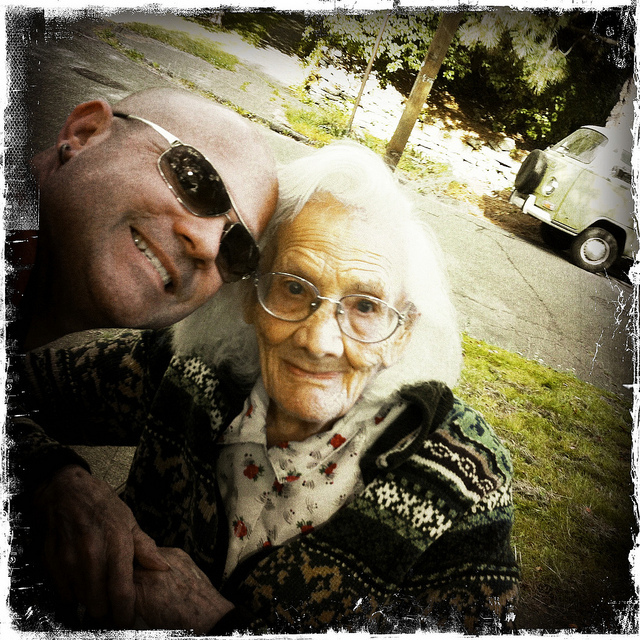 This blog is an exploration and celebration of my time as caregiver for my (currently 101 year old) Grandmother. The original publication of this site coincides with the second anniversary of my mother’s untimely death at the age of 62. Grandma was living with Mom when she passed and moved in with me shortly after Mom’s funeral. “One L Short of Normal” is something I’ve always teased my Grandma about. Her first name is Norma, and she’s a rare sort of person with a strange way of looking at things. She’s always been this way, apparently even from a young age. She is a strange and wonderful persistent old lady who is definitely one “L” short of “normal”. I know that what I’ve undertaken is an uncommon thing in our culture. There are times when it feels like the weight of the world is on my shoulders, but the rewards of having an alert, communicative elder in the house far outweigh the negatives. I hope that those who read this are at the least entertained by what I write. I’m not sure if I have any wisdom to impart, but perhaps some of what is written will resonate. If so, please feel free to comment and share this blog with others. Remember that our time on this earth is limited. Share love with your families. The rewards are there, if you seek them. We should all be so lucky to have a Rob . I’m not sure about all that…I just try to do what I think is right. It was easy with Grandma because she was a sweet little old lady who was just quirky enough to make it really interesting. lived in Ketchum for 20 years…84-04…i’m sure I saw your family at some time…sending Love and Light! Chances are you are correct, James…thanks for the thoughts!